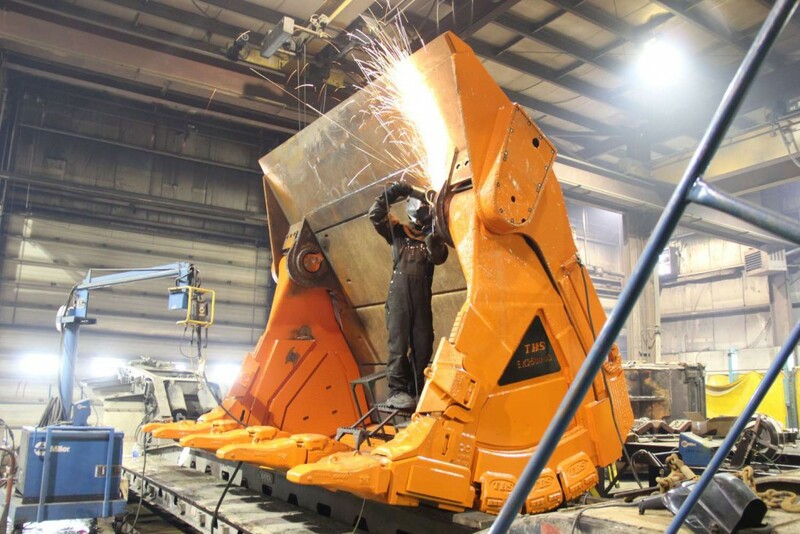 Custom Built Industrial Grade Buckets Define This Unique Ontario Fabrication Company | The Bucket Shop Inc.
Timmins, Ontario is best known for two reasons. It’s the former home of country superstar Shania Twain, and it boasts a long heritage rich in gold mining. Back in the day Timmins reportedly had the highest number of millionaires per capita in the country thanks to the robust, and often speculative, mining culture of the time. It also had the highest number of bars per capita, but that designation has become an historical footnote. Not so with mining and related activities though. Timmins is still the regional hub for mining, but also for forestry and construction, so it’s not surprising that a lot of heavy duty machinery and vehicles are concentrated in this community of some 45,000 people. The Bucket Shop is one such company that has carved a niche market in the heavy duty equipment and vehicle market. Established in 1989, it has for over a quarter century specialized in the manufacture, custom fabrication, and repair of all makes and models of heavy duty equipment. This includes scoop trams, excavators, loader and front shovel buckets and dozer blades. It has also earned the designation of master builder for the 2 -piece bolt together bucket for Atlas Copco, Toro, Jarvis Clark, and MTI, companies with a strong presence in the mining industry. Its customer base is similarly expansive, producing and selling new and used attachments to machine manufacturers and distributors, as well as to dealers and final end users. Considered a onestop shop for all bucket related needs, this well equipped facility located at 24 Government Road South in the city’s west end, has the latest tooling and technology to rebuild and manufacture industrial grade buckets. It is self sufficient, housing full steel sheets in bulk quantities, and manufactures its own pins and bushings, and forms and shapes all plate requirements. Curtis Westcott is Operations Team Lead for the company and sheds light on the manufacturing process. “Most buckets are made from either mild or AR400 plate with gauges that vary from 3/8” to upwards of 3-5” on custom lip applications. In addition to steel, we use Canadian Wear Technologies ABRECO. ABRECO™ ‘White Iron’ will outperform and deliver savings 7 to 10 times greater than AR400 Steel. In addition to White Iron, we will use Chromium Carbide for High Wear areas.” It’s not uncommon, either, to make improvements to existing OEM designs. “We have years of experience and countless hours of application- specific research put towards making lifecycle improvements. We have our own line of TBS HiPER components and engineering to help our clients reduce costs and improve uptime,” Westcott continues. Refurbished buckets at the site have weighed up to 36 tonnes – just for the bucket, and not the machine it’s attached to – and the new facility at the current location on Government Road has been custom built to handle even larger products. Most recent refurbishments were to a CAT 992, P&H Rope Shovel, a Hitachi EX 2500 and a CAT 6030. The new facility has a crane capacity of 70 tonnes capable of servicing virtually any bucket size in the Northern Ontario market. To put size into perspective, rock loader buckets, for example, have loading capacities up to 76 yards. The most recent acquisition by The Bucket Shop is Steeltec which supports its parent company with structural and custom fabrications, tanks, chutes and hopper liner packages. The field team has extensive experience in mining, ranging from underground and surface crushers, ore bins, monorail fabrication and installation, among other functions. By far, most of The Bucket Shop’s orders require custom work, particularly since different job sites often have unique digging conditions. Indeed, as conditions and rock hardness vary from site to site, design builds must be modified to meet the new requirements. Custom products range from bucket fabrication to bucket overhauls and refurbishment to a condition better than new. Specialty alloys, plastics, coatings and the construction of castings are all custom designed and built as well. Expect a 3 to 4 week delivery window for new builds. Westcott attributes a quality product to a full time engineering department and a team of what he describes as “an extraordinarily talented and trained staff of CWB qualified welders and Fitters. Our people are our best asset. We are extremely pleased with quality of workmanship that we put out, backed by a top notched QA/QC program and a staff dedicated to our entire client base.” Alongside the staff is the new 65,000 square foot state-of-the-art facility which Westcott says is crucial to the production of TBS HiPPER cast components, reportedly capable of revolutionizing the LHD mining market. HiPPER is an acronym for High Performance Enhancement Products, a newly branded line of quality cast components designed to extend the life of engineered buckets. With such precision, custom made manufacturing, The Bucket Shop is growing an international reputation. Though its core business is principally focused on the Ontario market, it has shipped further afield to the United States, Mexico and South America.